I am in the process of building a shelf for Norah’s room since there is no closet in her nursery. She will need something for her dresses to hang on. I got the plan for this from the “hand built home” book from Ana White. Instead of coat hooks I just added a closet rod. Someday I may remove this and add coathangers to make this an entryway shelf. 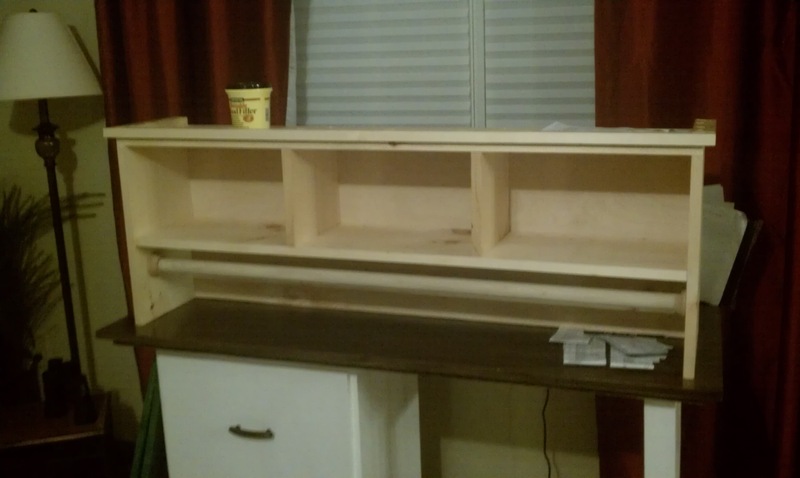 In the picture the shelf is on top of a desk I made over a year ago, so the plan is to paint the shelf in either pink or cream/white….not sure exactly how we want to do it yet.. Maybe flower stencils on the side? This entry was posted in Furniture Building, Life with Norah and tagged Ana White, building, desk, Furniture, shelf, woodwork. Bookmark the permalink.